Whenever you are trying to make line alignment with a quite advanced line measuring tool, it is just a super nice solution for users to make good use of 445nm blue laser line generator. According to its easy connect with an external electric power source of 3V DC input power supply, it is able to make immediate and super fine blue reference line on different working surfaces effectively. The time users are making easy select of output power and optic lens degree of this 445nm blue laser module, no matter vertical or horizontal working surface, this blue laser module is always making sure of high speed and high accuracy line instruction on all working surfaces effectively. Not the same as any other manual line drawing tool, in order to make line much finer, this blue laser line generator is adopting qualified glass coated lens. It is great work for users to get super high linear quality and high line fineness. In addition, according to its wide range glass lens degree of 10 degree to 110 degree, blue alignment laser line is just available with different line length from 0.5 meter to 6 meters. The whole process of laser line alignment is applied for multiple working environments. Besides formal industrial line alignment work, this 445nm blue laser line generator is also generating quite charming and attractive blue laser light in real line targeting work. It is providing fine and nice line aligning solution for laser displaying, laser show, decoration and military targeting work fields etc. No matter what kind of working surface, there is just no barrier at all for real laser line alignment work. Even though some of working place is very difficult to reach, however, blue laser alignment is generating noncontact blue laser line. Only if users are making free screw of laser beam aperture part, the thickness of blue reference line is freely adjusted, and then finally obtaining the clearest line instruction easily and quickly. No matter what kind of line aligning work fields, the real use of blue laser line generator is easy and quick. 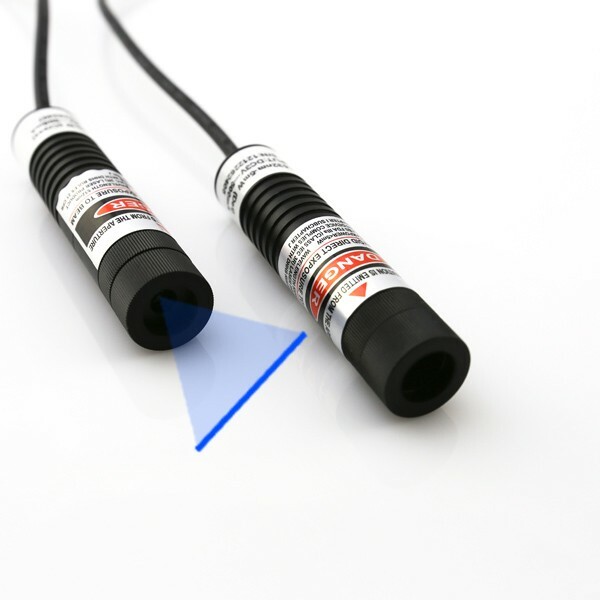 In addition, according to free adjustment of line targeting direction within three dimensions and special electric wires connecting both blue laser module and DC input power supply, this alignment laser is allowing free installation and adjustment within 3 meters, and then easily obtaining the clearest line positioning result immediately. Whenever users are paying high attention to powerful blue laser light and thermal energy, after easy work with a pair of laser safety goggles, this high power blue laser module makes no danger use perfectly.